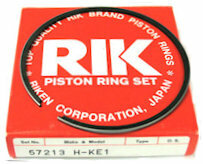 This is a Mitaka Piston kit STD type 2 rings, made in Taiwan but of very good quality. The piston has a coated piston skirt for lower friction,this piston is suitable for road or race use. Replacement Wossner Piston To Fit The Aprilia Tuono 125 Fits All Years And 122 Rotax Engine. 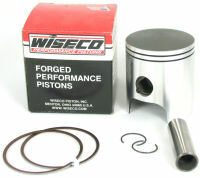 This is a Wiseco Piston kit made in The USA, The Piston is Forged For Better Strength. 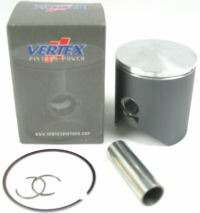 This Piston Is A Direct Replacment For The Std Item With 1 Piston Ring, Really Only For Race Use ! 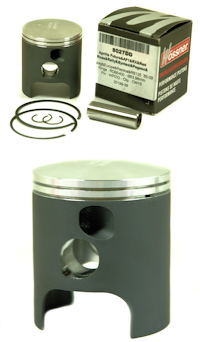 This is an oversize piston kit for the Aprilia Tuono 125, Fits 122 Type Engines. 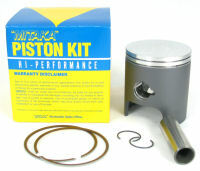 This Is A Replacement Piston Kit To Fit The Aprilia Tuono 125 Italkit 140cc Big Bore Cylinder. This Is A Set Of 2 Pistons Rings For The Polini Big Bore Piston. 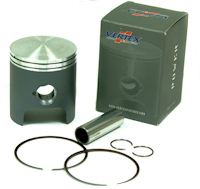 Vetex Piston Kit For The Aprilia Tuono 125 This Is A Flat Top Single Ring Piston Kit. ONLY FOR USE WITH A VHM FLAT TOP CYLINDER HEAD! 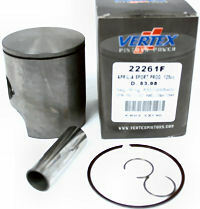 Vertex Pistons Are Made In Italy With A Molybdenum Coating,extending the coating. Aprilia RS 125 VHM Cylinder Head For Use With The A Flat Top Piston Only. The Cylinder Head Is Made From Billet Alloy. 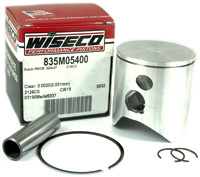 Wiseco Piston Kit For The Tuono 125 This Is A Flat Top Single Ring Piston Kit. 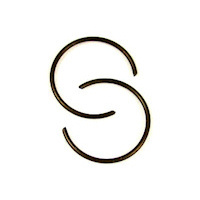 ONLY FOR USE WITH A MODIFIED OR VHM FLAT TOP CYLINDER HEAD! 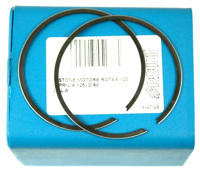 This Is A Set Of 2 Piston Rings To Fit The Tuono 125 Piston. 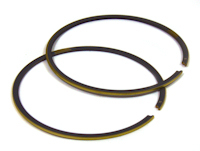 This Is A Replacement Piston Ring To Fit The Aprilia Tuono RS125 Italkit 140cc And The Aprilia Tuono 125 Mitaka Big Bore Piston. 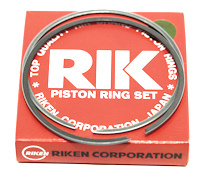 Note Price Is For 1 Piston Ring, If You Are Buying Them For The Mitaka Kit You Will Require Qty 2 The Same If You Are Buying Them For The Italkit Twin Ring Piston. 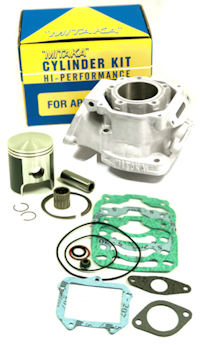 The kit comes with Nickasil plated bore, Piston, Piston Rings, G-pin, C-clips, Small End Bearing, 3 Base Gaskets, Cylinder Head O rings, Power Valve Gaskets and Power Valve Seal.